Lewes manager Darren Freeman heaped all the praise on his players after they sealed promotion on Wednesday night. A well deserved 4-2 victory against Sussex rivals Horsham in front of 764 fans at the Dripping Pan confirmed that the Rooks will play Bostik League Premier football next season. With three games of the season remaining, Lewes top the Bostik League South on 95 points from 43 matches. Freeman’s men are two points ahead of second placed Carshalton but they have a game in hand Lewes. Tomorrow (Saturday, 3pm) Lewes welcome East Grinstead Town. Next Saturday they are away at Faversham and their final fixture will be at home against Chipstead on April 28. Carshalton have to play Whyteleafe at home, Ramsgate (away), Sittingbourne (away) and VCD Athletic (home). Freeman was delighted to seal promotion but insists only half the job is done. The Lewes manager remains determined to finish the season as champions. “I’m pleased for the club all the players, all the fans and the committee members. The supporters have been fantastic this year and the boys have worked their socks off and they have got their rewards today. Jonte Smith opened the scoring against Horsham after four minutes and Ghassimu Sow doubled the advantage soon after. Dean Bown pulled one back for the visitors but the impressive Harry Reed made it 3-1 before halftime. Frankie Chappell scored a fourth for the Rooks with 10 minutes to go before the visitors pulled another back with three to go through Shane Cojocarel. “We came out from the blocks really sharp,” added Freeman. “The first 20 minutes I thought we were really good. We were a bit sloppy after that but it is about results at the moment and we got the three points and we scored four goals. “I’m a little bit disappointed in the silly goals we conceded. But at the end of the day we have beaten Horsham for the first time in a long time. “I was dreading this game to be honest with you. But it’s a great evening for the fans and the players and everyone involved in Lewes today. “It’s a great club and it’s a pleasure to work for a bunch of lads who have been outstanding. Barry Collins: A memorable night at the Pan. The squad @darren7freeman, @RossStanden01 and Codge have put together are not only the best squad I’ve seen at the club, but a great bunch of lads too. Very proud to be a director of @Lewes_cfc tonight. Tom Goodwin: Congratulations @Lewes_cfc from the shores of Lake Geneva. Always proud to be an owner, but especially so today. 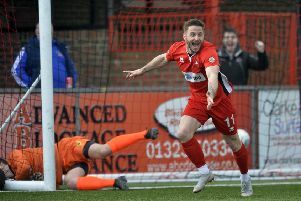 Eastbourne Borough FC: Congratulations to @Lewes_cfc on their promotion to the @IsthmianLeague Premier Division! Paul Hayward: Great management by @darren7freeman. Put all the elements of a promotion winning team together. Not easy.